Jewellust is an app for Google Android that was created by Smartpix Games. Jewellust simulates the world of Ancient Egypt with all of its jeweled splendor. When you are playing the game, you get a chance to go back in time and bust through jewels in an attempt to garner the highest score possible. Jewellust is classic arcade action with a historical twist and it is one of the newest gaming additions to the Google Android platform. The controls for Jewellust app for Google Android are actually quite easy to master. 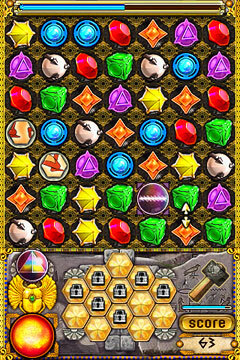 All you have to do is scroll around the grid of jewels that you see on the screen and then select different gems to move and bust depending on proximity of color, shape and other characteristics. It is essentially a point and click game at its heart and interacting with games that have that type of classic arcade controlling options is very easy to do. As far as the interface is concerned, there are three major screens that you have to deal with when you are playing the Jewellust game. The first of those screens are the title and the adjoining options screens, both of which are very well designed graphically and contain the options for the rest of the game. An example of this would be the initial option available to you between playing in the single player campaign and playing in the high score challenge. Once you have gone past this screen, you are in the selection screen where you can actually make choices regarding the pyramids that you would like to enter. Once you have made your selection on that screen, the main game screen actually comes up with the starting gems that you need to manipulate in order to get as high a score as possible. Between these screens, the Jewellust game has a brilliant interface that is very easy for anyone to understand. Jewellust application for Google Android is very similar to bejewelled and other games like it for other systems, although there are some key differences that arguably enhance the productivity that you can get out of this game. For starters, this game is a lot easier in campaign mode than bejewelled, which for many people also makes it a lot faster. Games that are faster are generally easier to play within commute times and lunch hours and therefore those types of games tend to be far more useful on mobile devices such as Google Android. At the same time however, the graphical user interface contains graphical elements that are absolutely top notch. Too often, many mobile apps are willing to sacrifice graphics for functionality, but Smartpix has put in the extra time needed to make sure that both are present in this Google Android application. In the end, the combination of functionality and beauty is probably the main selling point for this game. It certainly impressed us during this review and therefore Jewellust app for Google Android receives a score of 9.0 out of 10.